The webinar has been broadcast, you can access the slides and recording by clicking here. In this commercial webinar, Omnicom’s Raúl Gordo presents “A Game Changer in the Understanding of Toy Consumers” – which was recently presented at the ESOMAR Congress in Berlin. The presentation looks at how a tracking system integrated with behavioral data can be used to drive the toy business during the Christmas campaign. After the presentation, there is a panel discussion with Raúl, Ioana Nitulescu, Sue York and Ray Poynter, moderated by Netquest’s Joaquim Bretcha – broadcast from Netquest’s headquarters in Barcelona. 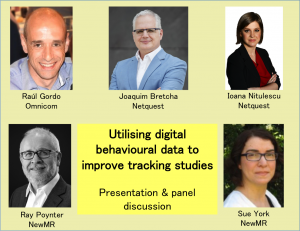 In this webinar you can hear a state of the art case study of how behavioural data can be incorporated with survey data to improve trackers, making them more actionable. A project we are running on Artificial Intelligence, with a survey link and a link to a summary of the live data, click here. Our blog, with posts covering a wide range of market research and insight-related topics, click here.